Last week we spent some time in beautiful Montreal visiting our daughter. It was my first trip there in over 40 years (gulp) and we visited the Montreal Museum of Fine Arts. I was so inspired by the oil paintings I saw from artists in Montreal who were contemporaries of English Canada’s Group of Seven, that I came home and pulled out my oil paints and got to work. 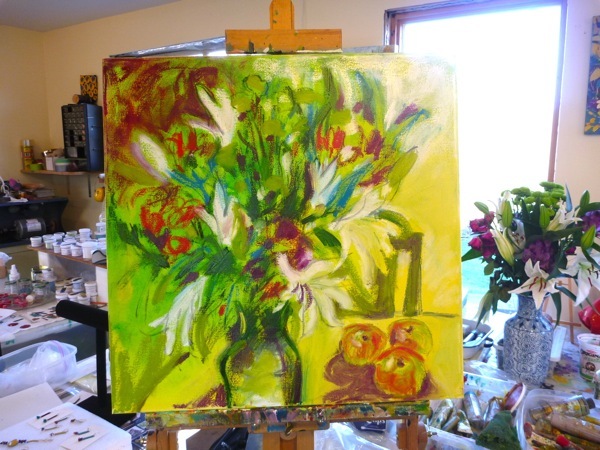 I chose a yellow and green acrylic ground for the painting because of the fresh ‘alive’ feel I wanted for the bouquet. There are no flowers left blooming in my garden. The cold has taken care of that. The pickings are slim (pardon the pun) for buying flowers in rural Nova Scotia, but I was delighted to put together this bouquet from the grocery store selection in Digby. If varieties of fresh flowers are important to you in winter, don’t even think about moving here. By the time I finished blocking in the shapes, it was dark outside, so I called it a day. That night as I fell asleep I kept thinking about what should belong in the large yellow space. 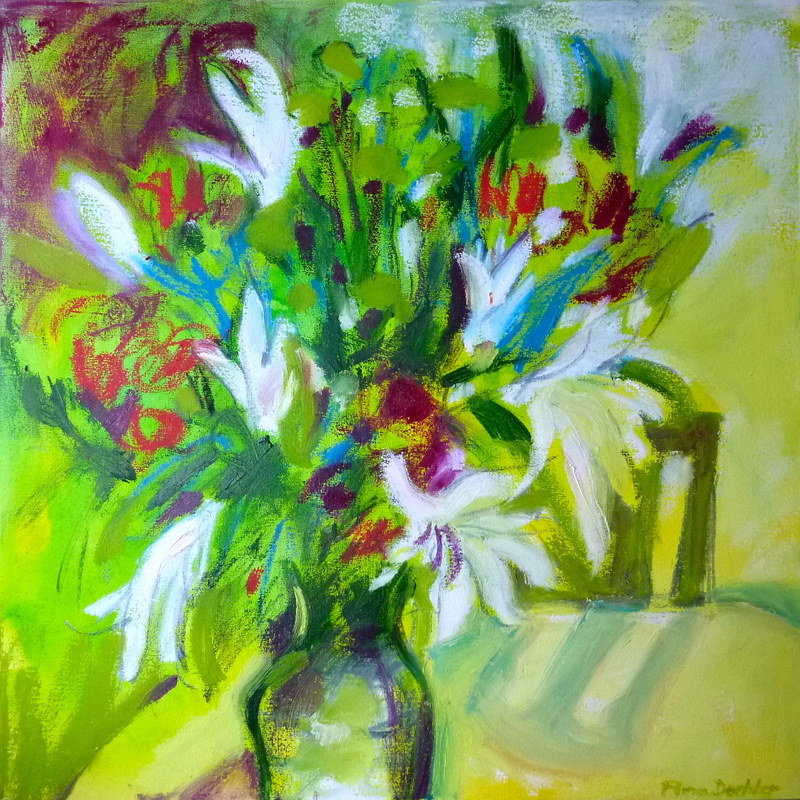 I loved the colour and I hated to cover it, but the painting needed more development. I mostly worked with oil sticks which are super messy, but allow me to draw the image or use a paint brush. And here’s the thing about painting. Sometimes the main part can happen in a spontaneous, inspired way and everything flows together. But there will always be an area of the painting that causes more grief than the rest of it put together. At least, that’s how it is for me. I was happy with the gestural line and texture and tone of this painting and I think it reflects the feelings I had about the work I saw in Montreal. 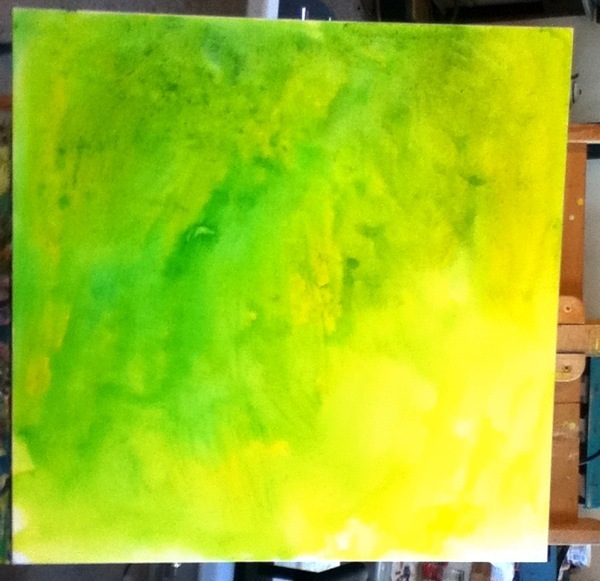 But that darned yellow canvas area…..that was a challenge to resolve. When I woke up, I thought about the interiors I’d seen in paintings the previous week and I decided to place a chair from the 40’s to suggest a table and to give the painting a nostalgic feel. But now the tabletop looked empty. I decided to include fruit. 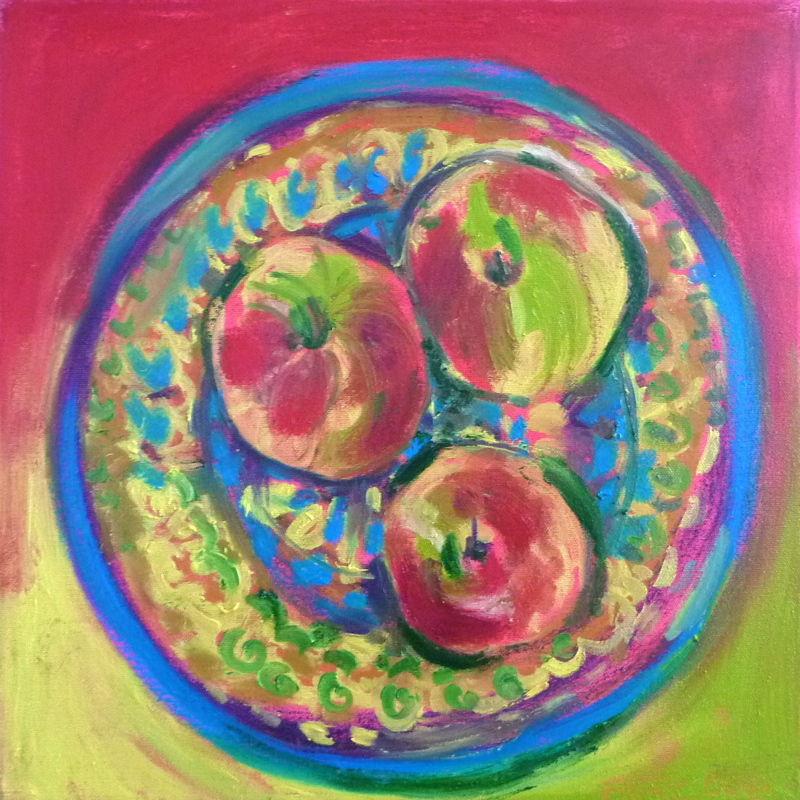 I brought out a plate of Nova Scotia Gravenstein apples and added them to the painting. I defined the table edge on the left hand side of the painting. The next day when I looked at the apples, I didn’t think they fit in the painting, so I got out my turpentine and scrubbed them out. But in looking at the apples on my German pottery plate from the early 70’s, I’d fallen in love with the look of apples. 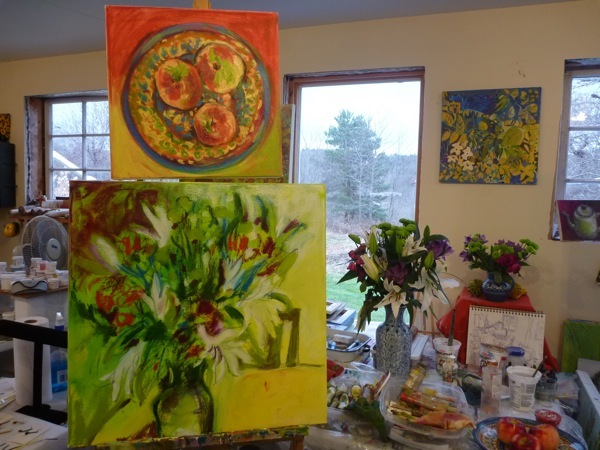 I had to take a detour from the flower painting and begin a study of the apples. They really deserved their own canvas, wouldn’t you say? 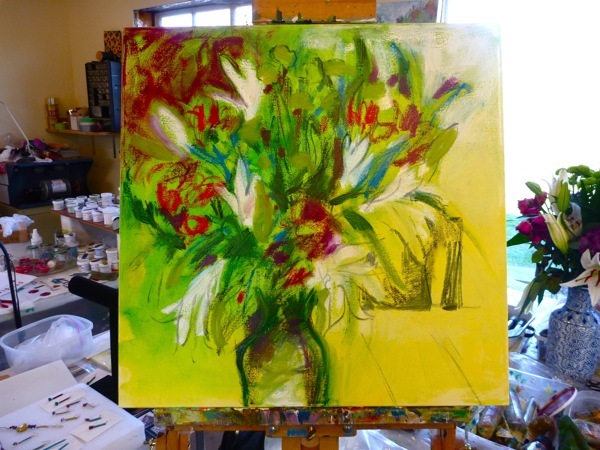 I went back to my flower painting and had gained another day of thinking about what to do in the big empty yellow space. I wanted something that wouldn’t overpower the bouquet. I chose to break up the yellow of the table with a long shadow from the chair. The shadow points towards the vase to which pulls the viewer’s eye there. The shape of the shadow reinforces the style and age of the chair. The painting will require at least a few weeks to dry. It is definitely my Homage to Montreal. Gravensteins. oil painting by Flora Doehler, 2013. < When the Ocean Paused for me. 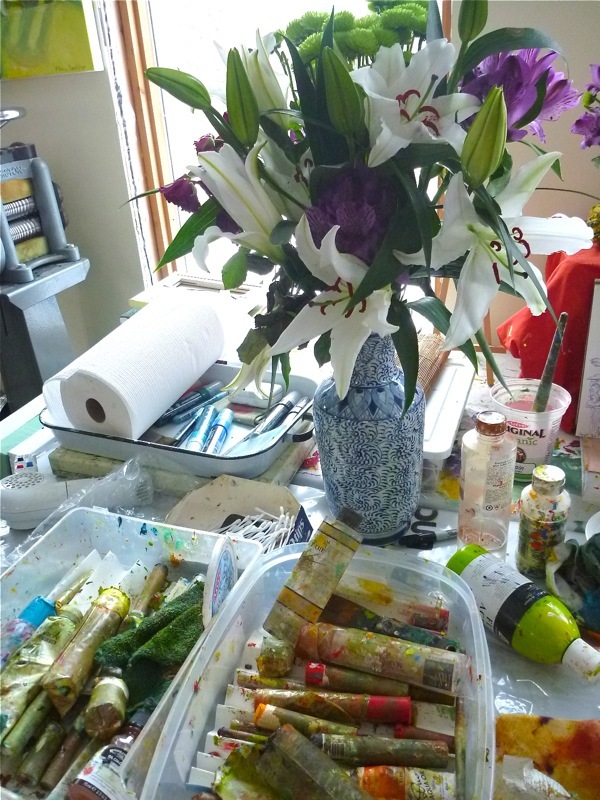 Love your thought processes throughout – painting day for me tomorrow!!! I really enjoyed how you took us through your process. Both paintings are lovely! Hi Susan! I hope you got a painting day in there. And you Sara, I’m glad you enjoyed hearing about my process. I haven’t painted for almost 2 weeks now as I prepare for the xmas craft shows. After this Saturday in Annapolis, I’ll be immersed again. Two weeks feels like a long, long time. 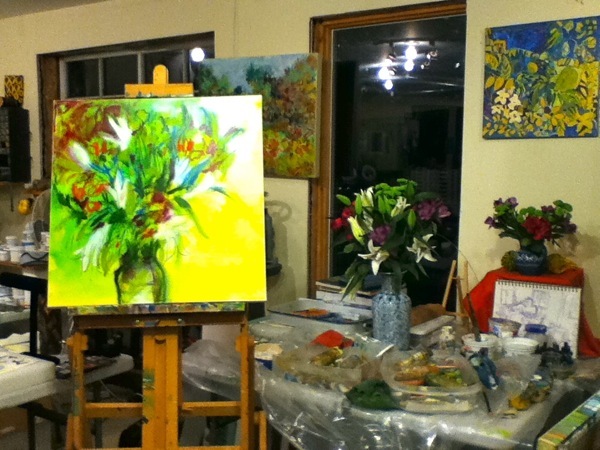 I am still loving that green painting so I think I have to keep it….for now anyway. Thanks so much for visiting my site here.